whose identification with the supreme Self is uninterrupted. to awaken the spiritual energy, or kundalini, in seekers through shaktipat. 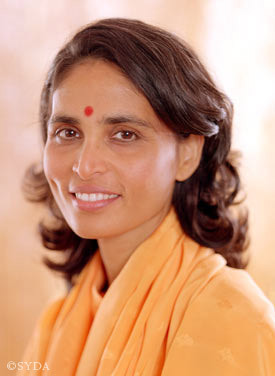 who walked the path of yoga under the guidance of her Guru, Swami Muktananda. from Swami Muktananda before he passed away in 1982.
is attainable in this human body. Gurumayi constantly points us back inside ourselves, where this state is accessible. to their own potential for enlightenment by bestowing shaktipat. helping them move beyond their own limitations and reach the goal. and she has written books and songs expressly for them. through the work of the SYDA Foundation. “In truth, the gift of life must always be recognized and never be taken for granted. Why is life so precious? we have a rare opportunity. is a sign of an illumined heart.